Canadian law firm Miller Thomson has relocated its Vancouver branch to a new, open-concept office space above the Nordstrom department store in the redeveloped Pacific Centre building. The space at the Cadillac Fairview-owned Pacific Centre is designed with interior office pavilions with modular workstations with options for raised desks for staff, customizable meeting rooms, a café, balcony and a large, landscaped atrium. Miller Thomson is a national business law firm with more than 525 lawyers working in 12 offices across Canada. For law firms such as Miller Thomson, gone are the days of broad oak desks hunkered in massive corner office suites guarded by receptionists. 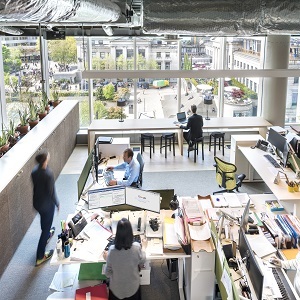 Instead, firms are opting for open spaces that promote technology, interaction and mobility, said Mike Walker, Miller Thomson’s managing director for B.C. “It’s very interesting dealing with lawyers who started practising in the 1980s versus lawyers who started practising now,” Walker told RENX. “The people who are starting out now, they really want the technology and they really want access to the knowledge that established practitioners have. “They don’t feel like the disappearance of the corner office and the big oak desk is a big deal. The building at 725 Granville Street, redeveloped in 2014, is also home to Nordstrom, Microsoft and Sony Pictures Imageworks. The property is part of a wave of new office projects — including the new TELUS Garden, Manulife’s new 16-storey office at 980 Howe and others — that are starting to pull Vancouver’s white-collar core south of Georgia Street. The 48,000-square-foot Miller Thomson space includes floor-to-ceiling perimeter glass with views of the Vancouver Art Gallery pavilion. Work stations are aligned sporadically in the open without cubicles, with desks and without. Private discussions can be held in glass meeting rooms, still fed by natural light. The move comes as downtown Vancouver approaches an office vacancy rate of about five per cent, despite the introduction of several new office tower projects over the past 24-30 months. But with a three-year lead time, Miller Thomson didn’t feel much competition for the space, Walker said. The firm knew its lease was to expire at the former space at 840 Howe, located within two blocks of the new space. The firm came around to the idea of having one broad floorplate with everyone on the same floor, in a space that could be designed to its exact tastes and needs. “We started doing some planning on it and our people started getting excited about the possibilities,” he said. The space holds about 145 staff and could expand to accommodate 165 in the current configuration.